Okay, what is with the water in Australia? Why are there so many authors there? And how can I procure some of that stuff? Contemporary YA is slowly becoming my favourite genre. Not just because of this book, mind you, but it does play a major part. It's just that nearly every contemporary YA book I've read in the past year has been fantastic. Brooklyn, Burning? Amazing! Gone, Gone, Gone? Rocked my socks! Zero? Five Flavors of Dumb? I honestly want to marry the love interests. Yes, both of them. We'll settle in Utah and wreck havoc, while they teach me drums. YA Contemporary is on the rise, is all I'm saying. And there is just something about Australian authors that just makes stories tick. I mean, Melina Marchetta, Marcus Zusak, and now, Cath Crowley? The awesome just springs from there (with ONE notable exception, which shall not be named here). 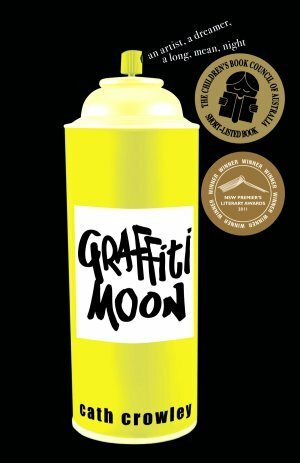 Graffiti Moon takes place in the span of one night. Lucy has just graduated from high school and has decided to spend her first night of freedom in search for Shadow, a mysterious graffiti artist whose murals arrest her imagination and move her to the bone. Little does she know that Shadow is a guy she dated (and whose nose she broke), and that he's planning on robbing her school. Life hasn't been good for Ed, but he doesn't complain. Sure, he dropped out of school, can't remember what he's read and got sacked from his job, but as long as he's got his art, he's happy. But his friend and fellow street artist owes some money to someone he shouldn't be owing money to, and that rent isn't going to pay itself. But then Lucy and Ed meet, again, and he decides to help her search for his alter ego, and during that search, the two discover some very interesting things about themselves. What makes this novel stand out is the voice. Both Lucy and Ed (and Leo, but his contributions are far and in between), are strong narrators, and they like to stand by their opinions. They're also very independent, to the point of pig-headedness, but that only makes them more endearing. The writing is wonderful, too. Just look through the quotes that are no doubt popping up as I write this for proof: It is just that wonderful. Cath Crowley has a writing style that is lyrical without venturing into the bruise-purple zone. It creates a beautiful imagery, which comes in handy when so much art is being discussed. It also manages to give the reader a sense of the pieces discussed without making it sound like hipster name-dropping. I found myself Googling the different artists mentioned just to see what the deal was, and it is truly fantastic. The ending was a little meh for me - it just seemed like Poet's secret and the school breaking-in bit got resolved a little too clean for my tastes. But it didn't take away from a wonderful read, for which I am grateful.